This differs from the commercial release which is missing track B1, but mislabelled as containing all 4 tracks. 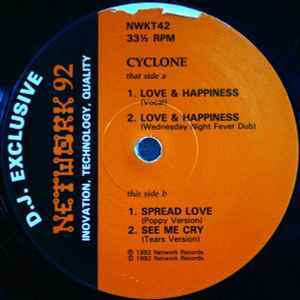 "Love & Happiness" was the original version of "No Good (Start The Dance)" by The Prodigy. It has added vocals, that aint found in the later version & is an all round nice classic house tune :o) The beats are smooth & the use of a funky melody is the icing on the cake. If you liked the Prodigy's version then you could do a lot worse that checking the original out, as it wont disappoint & i prefer this to any other versions that iv heard.